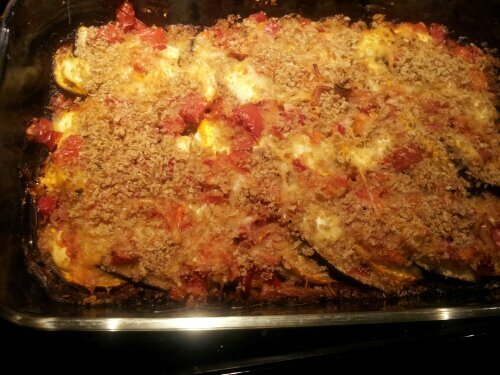 My sister makes a delicious eggplant & zucchini gratin. She uses a lot of olive oil, good cheese, salt & pepper, a few other spices that satisfy her whim of the day (although this always includes fresh ground coriander)…and cream. Heavy cream. Just a little bit. Where most people might drizzle olive oil (which she does that, too), she drizzles heavy cream. When it’s done, you’d never know that there was heavy cream in there. But it is good. So good. It’s so good, that it’s one of those dishes I’ve been afraid of making (really, me?) because I feared it would not be as good as hers. Well, this is not quite the way she makes it, but, it’s what I had on hand and needed to use up. Slice the eggplant and zucchini (or squash) about 1/4 inch thick, and set aside. Dice the tomatoes, red bell pepper, and garlic. Transfer to a small bowl, and season with salt and pepper. Stir to combine. If you have fresh herbs (oregano, basil, parsley), this would be a good place to work them in. Set aside. 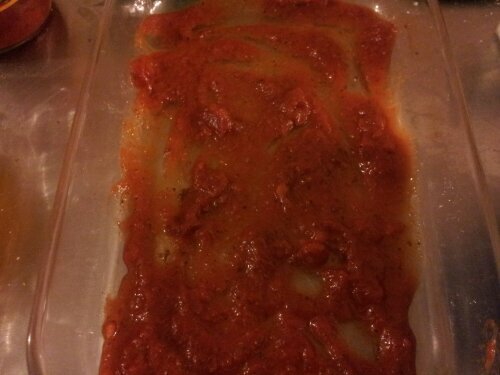 Spread a thin layer of leftover sauce (or olive oil, if you have no leftovers) on the bottom of the baking pan. I really prefer heavy pyrex or enamel-ware for gratins like this, because the bottoms won’t burn before the top is done, as they will in a thinner metal pan. 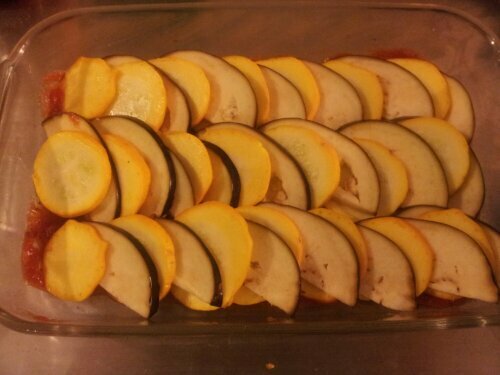 Lay out the zucchini and eggplant in an alternating fashion, as thin or thick as you want. The thinner it is, the shorter the baking time and crispier. The thicker the vegetables, it will take longer to bake through, and there will not be as many crispy bites. Top with cheese. I used an herbed goat cheese that had been languishing in my fridge forever. 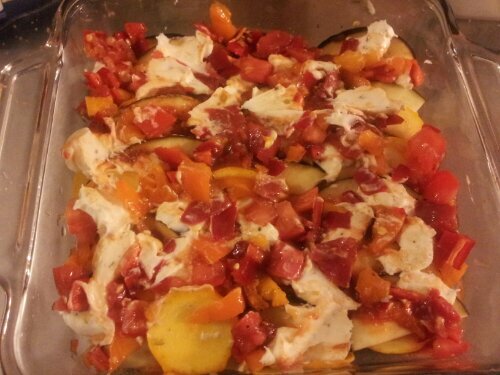 I also added a little preshredded mozzarella on both, and some little mozzarella pearls on one pan. This is a good time to use up bits and pieces of cheeses. Parmesan, Pecorino, cheddar, asiago, provolone….ricotta…whatever needs to go. Top with the fresh tomato sauce, making sure to save some for the whole thing. 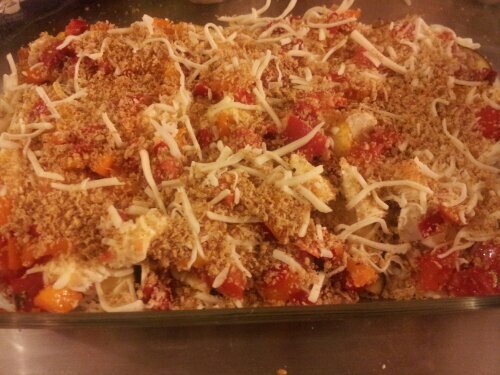 Top with more cheese, if desire, and breadcrumbs. A little Italian seasoning if you don’t have fresh herbs…and a drizzle of olive oil. Seal with aluminum foil and back for 45 minutes to 1 hour 15 minutes, depending on how thick the resulting dish is. **My friends loved it. We polished off one dish at lunch today between three of us. The only thing that two of us thought would be good in there would be some mushrooms. 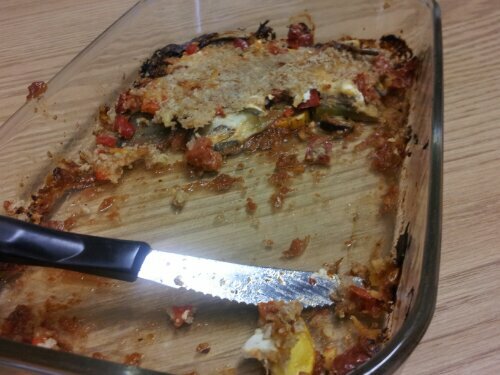 It was like eating lasagna, but without all the pasta, meat, and heavy cheeses. 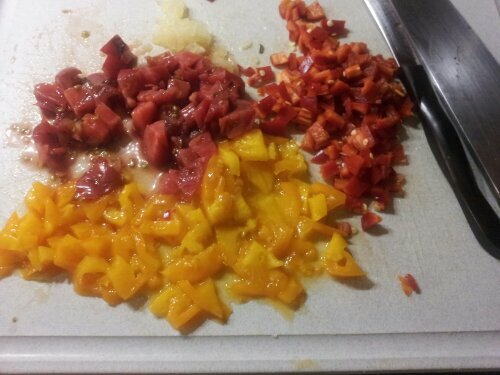 Diced fresh heirloom tomatoes, lipstick bellpeppers, & fresh garlic. 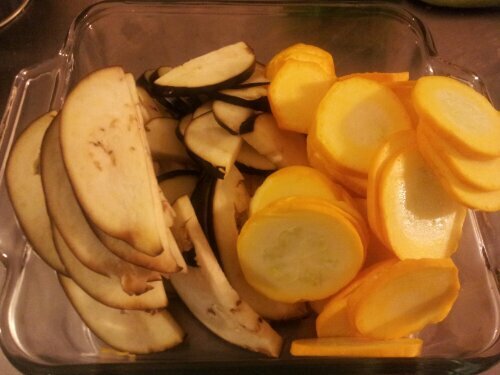 Alternating the eggplant & golden zucchini. The gratin topped with herbed goat cheese and the raw tomato sauce. 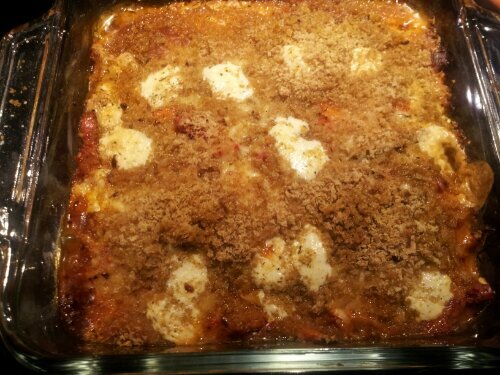 The gratin topped with bread crumbs, mozzarella, and olive oil. I made one dish in a 6 x 11 pan, and the other in an 8×8. Yummy recipes. Thanks for visiting my blog today!